The issue with being a long term pushchair reviewer is that over the last ten years pushchair quality and technology just keeps better. When our children were small, the Babystyle Oyster 1 was very much THE mid price pushchair that our birth group of parents was buying. It was innovative and stylish at a great price. When Babystyle released their Oyster 2 in 2014, they improved the niggles that we had with the Oyster 1, including the fabric packs and seat recline. 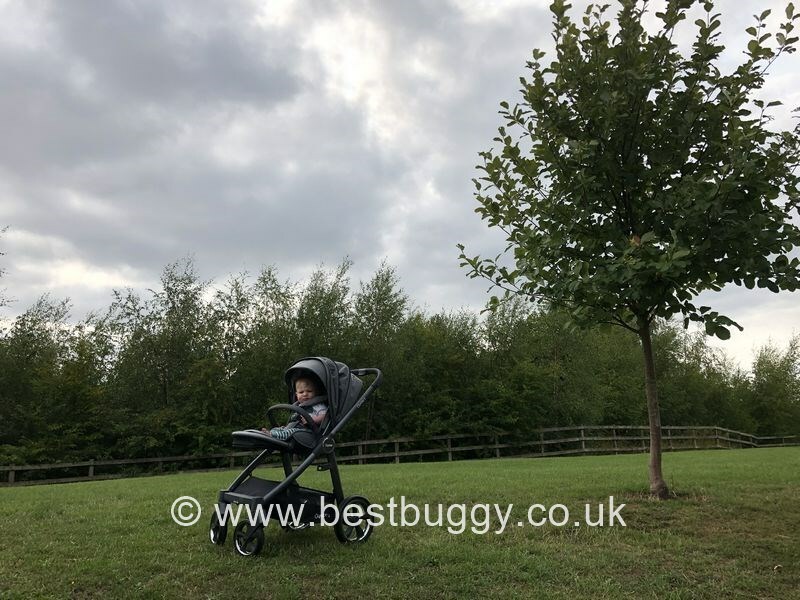 At the time we couldn’t really fault the Oyster 2, and we didn’t think that Babystyle could improve on it, and we awarded the Oyster 2 a Best Buggy 5 Gold Star rating in our review. However, in 2018, Babystyle unveiled their Oyster 3, and this new incarnation of the Oyster stroller has completely blown us away. When you first look at the Oyster 3, its hard to actually believe it is related to the Oyster 2. When you see the Oyster 3 folded it is FLAT! Yes, flat- and when folded with the seat both forward AND parent facing! The fold was always the most frustrating part of the old Oyster strollers, because it was bulkier than really a small fold pushchair should have been. However when the Oyster 3 is open, it looks huge. When we first saw the Oyster 3 next to the Oyster 2, it made the Oyster 2 look like a doll’s pram. The chassis feels bigger, the seat is definitely bigger and higher, and the hood is larger. Everything about the Oyster 3 is bigger. But yet, the fold is actually smaller! Hard to believe….but it is true! The other huge change is the fabrics. Gone are the black seats with the colour pack hoods and liners. Instead are beautiful, quality, durable fabrics. Our Oyster 3 is a grey melange which looks incredibly smart and luxurious. All round the Oyster 3 just looks and feels like a top luxury pushchair but at an affordable price. The other pushchair next to the Oyster 3 (grey) in our photos is the Egg Quail (gold). There’s no doubt that whether you have an older baby or a toddler, that they will be comfortable in the Oyster 3 seat. The seat is suitable from birth to a huge 22kgs – this is excellent for a pushchair. The seat depth in particular is excellent. The seat has 3 recline positions which includes a good upright position, and a lie flat recline position in both a forward facing or a rear facing position. The recline is easy to do using a beautiful lever at the rear of the seat. It is so much simpler and smoother than the old Oyster recline. The Oyster 3 boasts a shaped, supportive, head rest with padded side wings to the seat to keep chilly winds out. There is thick padding below the shoulder harness and across the fold handle in the centre of the seat base. This handle is there to faciliate removing the seat by pulling forwards and lifting the seat upwards. However our seat sticks on one side, and we have to start to fold the seat into a clamshell before it will release. We think this is just a glitch on our pushchair though. Also be aware that if the seat removal handle doesn’t lie flat when you let go, then it could cause an uncomfortable ridge for your child to sit on. So just check this is flat before popping your child into the seat. The Oyster 3 has a proper enclosed calf rest so that little feet can rest comfortably without falling off at the sides. The foot rest will pop up if you felt your little one needed additional support under their feet. This is particularly useful for an older baby who just needs legs supporting. A small detail that we like is the silver on the footrest adjustment buttons – it just adds to the premium feel. For an older child there is a good lower footrest with plenty of room for little feet. The grooves on the footrest should ensure a child doesn’t slip when clambering in and out with wet feet. The seat all round feels very spacious and long, however because of this we would want to use a baby nest or snug for a newborn, just because we think they would feel lost in the seat. The seat comes with a gate opening bumper bar included. This can be left in situ when the seat is folded without making any compromise to the fold. The bumper bar is covered in textured leatherette. The bumper bar needs lifting up into place when the pushchair is opened, or can be easily opened or even removed to allow a toddler to have open access to the seat. The only negative is that our bumper bar has gained an indentation in the leatherette whilst being stored. The seat harness height is linked to the hood height – the theory being that as your child grows they require more space under the canopy. Finding how to actually adjust the hood / harness led us reaching for the instruction manual. It isn’t something you are likely to do often, but we bet you will have forgotten the trick when you need to do it! At the base of the hood on either side is a tiny button. Press this in and pull or push the hood up or down to adjust the height. It is quite stiff to move the hood, but we like this mechanism because is far easier than having to thread a harness in and out of the back of a seat unit! Having the hood lower on a little one keeps them well protected too. The harness is covered by thick pads to ensure the comfort of your little one. We don’t like the 5 piece ‘jigsaw puzzle’ piece harness. The shoulder and waist straps need aligning on each side, and can be inserted a side at a time into the buckle. The shoulder pads are so thick, that its difficult to find the shoulder harness ends because they disappear up inside; or the shoulder pads fall off which is frustrating. The harness parts need a firm push into the buckle but it means that the buckle is difficult for a child to undo, thus ensuring their safety. The hood is in three sections with the middle section hidden behind a zip. There is also a zip off visor too. The hood is lined in the upper two sections and the lower section has a lift up section of fabric which reveals mesh for ventilation in summer. The sensible positioning of this in the bottom section means that the sun is unlikely to bother a sleeping baby if the seat is reclined, whilst the cooling air refreshes them. For an older child using a slight recline, the mesh would probably be directly over their head, so be mindful of this when using. The hood and apron are well fitted to keep your baby snug and warm on the coldest of winter days. When the hood is pushed back out of the way of the child, the section of fabric that covers the mesh flops down behind the seat which looks a little unsightly. It could do with a way to secure it. There is the option of a beautiful carrycot for the Oyster 3. The carrycot is one the best we have ever seen here at BBHQ, for ease of use and finish. We love the peachy soft fabrics used to line the carrycot and the inside of the apron, and the mattress is thick and comfortable. We like the subtle curve that the carrycot apron makes when it is poppered up at each side, although we did find it difficult to attach the press studs, especially as you end up pressing the hood lock button in order to try to attach them. We love the one handed removal of the carrycot from the chassis, using the handle behind the hood. We especially love that the carrycot has a curved bottom so that your little one can be quickly rocked back to sleep should they be disturbed which is a fantastic idea. However, it is the small unique details that impress, and the four small, easily popped out feet are simple but quite brilliant. The carrycot hood opens and closes using a press in button on each side. The hood is very similar to the pushchair hood except that there is no zip concealing the middle section. We love the Oyster logo leatherette detail on the apron, and the leatherette on the handle, which just finishes the Oyster 3 carrycot off with a touch of style. A rather ugly plastic label with a yellow sun, tells you that the hood has a 50+ UV Protection rating on it. A more discreet fabric tag would have looked better on such a stylish product in our opinion. But its only a tiny detail. The whole hood can be removed, and we are sure that you could probably get new carrycot fabrics from Babystyle for a new baby if you fancied a change. The carrycot folds flat for easy storage. The Babystyle Oyster 3 has a large spacious basket. We love the depth and easy access from both front and back, which means that a changing bag can easily fit, and no small items will fall out. We like that juice cups or bottles can be stood upright too. At the front of the basket is an elasticated pocket which is fab for storing a raincover or drinks in. Due to the pocket being on the upper side of the basket, it is not taking up valuable space in the basket. The higher seat / carrycot position allows more room in the basket too. Great for shopping or days out! The Oyster 3 has a secret zipped storage pockets underneath the footrest. However, unlike its predecessors, this does not conceal an insect net which is a bit of a shame because it was handy to have one there, just in case. The positive side is you gain the secret pocket to keep small valuables in. The Oyster 3 usually comes with a raincover, however, we did not receive one to test. The carrycot has a separate raincover to the seat one, and this fits on nicely with a flap opening for the handlebar. The handlebar extends telescopically through a range of 4 positions and most parents would find a comfortable setting for pushing. It is simple to extend the handlebar using the button in the centre of the handle. However, the plastic around the button does meet the floor when the pushchair is folded, and although our Oyster 3 hasn’t had heavy use, this plastic is quite scratched. This is not unusual in this type of folding pushchair though. It is better the plastic gets scratched than the leatherette. The Oyster 3 handles beautifully and we have enjoyed taking it out and about with a variety of children in the seat. The large rear wheels help the pushchair go over most every day terrain, and the non puncture tyres should take you all over. The front wheels can be swivel or locked straight. Babystyle have made a new front wheel locking switch – it is a single sliding button on the front of the footrest. We miss the press button wheel locks of the old Oyster 2 – there was always a satisfying click! The brake is central at the rear of the pushchair. It is easy to step on the brake to apply, and can be stepped back on again to release. The brake engages with an audiable click. The Oyster 3 can also have a car seat attached, and an Oyster board to make it a functional way to transport two children (max 20kg on the board). The method to fold the Oyster 3 is almost identical in theory to the previous Oyster pushchairs. However the big difference is that the seat can be folded nearly identically neatly in both forward and rear facing positions. This makes a massive difference especially if you are more likely to use the seat parent facing. To fold in either direction simply fold the seat in half like a clamshell. Then using the two black slider buttons underneath the handle on each side, drop the handle forwards towards the front wheels. Use the handle under the seat (sticking out at the rear), to pull the chassis upwards until the pushchair folds shut and locks. It is possible to slide the chassis towards you holding either side of the chassis until it closes. Either way is very simple, and the resulting fold is flat whichever direction the seat was left on. To open the chassis, simply undo the fold lock at the side of the pushchair and lift the handle upwards. The rear wheels and front wheels will slide apart into an open position. Push down on the handle and the chassis will lock. Then using the silver seat recline lever at the rear of the seat, lift the seat back upwards until the seat is in the position that you require. Lift the bumper bar up until it locks. The new compact, flat fold is one of the triumphs of the new Oyster 3 and we love it. When we reviewed the Babystyle Oyster 2, we could barely fault it, and similar is true of the Oyster 3. It is a great all round pushchair, which has been massively improved particularly in the styling and the fold. Whilst our seat mechanism is sticking, we don’t believe this is usual. We don’t like the flappy rear of the hood, but its a minor thing that could be tucked away. Yes, the insect net and seat apron are no longer sold with the pushchair, which is a shame. The biggest negative is the harness buckle which is frustrating to use. But the hood could be fixed with a fastener, and it may be possible to change the buckle. However the positives are many, many improvements to the seat, to the harness height adjustment, to the recline, to the hood, to the wheels, to the fold and more. Above all the fabrics and finishing details of the Oyster 3 has taken this pushchair up another level. Whilst the Oyster 3 is more expensive than the Oyster 2 was, it does feel very much justified due to the superior quality and luxury feel. However Babystyle have still kept the Oyster 3 in the more affordable mid price range, especially considering that no carrycot is required to use the pushchair from birth, although we would factor in the price of a baby nest. 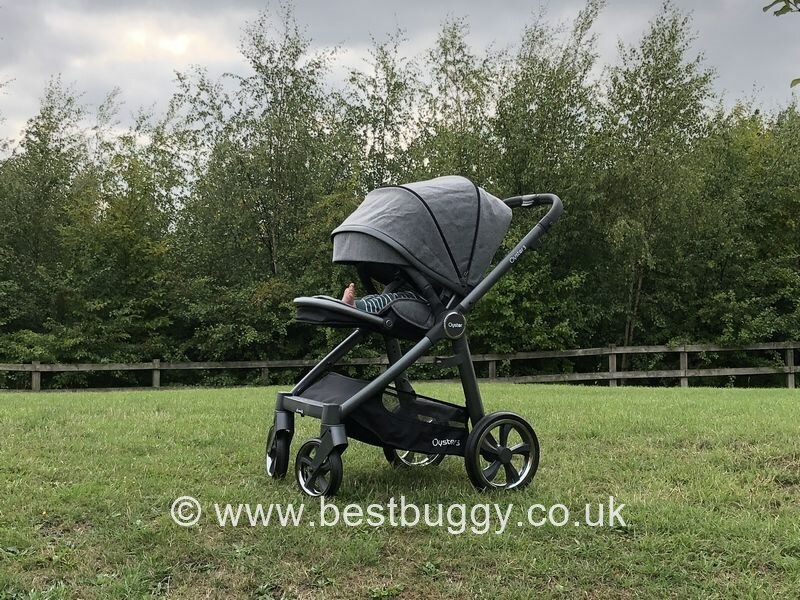 The Babystyle Oyster 3 is far superior in every way to the Oyster 2 of 2014, but unfortunately our star rating system doesn’t take into account technological advances nor does it give us scope to give the Oyster 3 more than 5 gold stars. We debated whether the negatives justified losing half a star but we didn’t feel they did compared to the Oyster 2 and everything comparable currently on the market in this price bracket. All the other features, and especially the new innovation are superb. So we are delighted to give Babystyle another Best Buggy 5 Gold Star rating this time for the Oyster 3, because it is really is a fantastic all round, practical but stylish pushchair, and we don’t think anyone could want for more when looking for the perfect pushchair. Highly recommended by us.